DESCRIPTION: Beautiful custom built lake front home near Bar Harbor and Acadia National Park (approximately 1 hour by car). This home has all the comforts with 16 foot cathedral ceilings, custom wood work and hardwood and stone flooring. The home also features CENTRAL AIR CONDITIONING for those hot summer days & nights! At home, on the lake, guest will enjoy peace and quiet as power boats and jet ski's are not permitted. 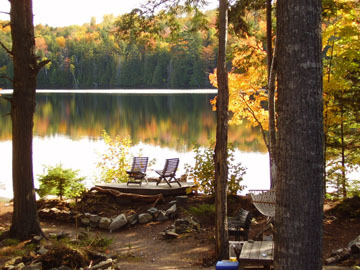 The property has a large camp fire pit, shore side deck and of course a dock and float in the water.also There are trophy brown trout in the lake for fishing and the spring fed water is pristine for swimming. A traditional Maine wooden row boat and canoe are also provided for use. LAYOUT: Large living room w/ fireplace, wet bar with wine storage. A cozy window seat. 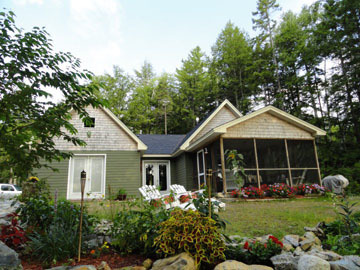 Large screened porch with dining table and additional seating facing the lake. Well equipped kitchen. Dining area w/ large table for seating up to 8. Master bedroom with a queen bed, fireplace and patio doors facing the lake. Bedroom with a queen bed. Full bath with jacuzzi spa tub with a separate shower. OTHER: Semi open loft bedroom with a queen bed. SPECIAL CONDITIONS: 3PM check in & 10AM check out. Maine fishing license is required for fishing which can be obtained at the local country store 15 minutes away.